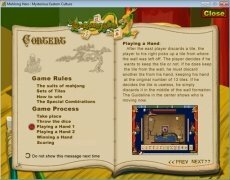 Mahjong Hero is a faithful version of the classic Chinese Mahjong game. It is a table game for four players the main objective of which is to form groups (melds) of tiles, like melds of consecutive suited tiles or three/four tiles of the same number. You will play against three players handled by the computer and you will have to form a Mahjong to win. To start off, the four players will throw dice to decide who starts the game. The player with the highest number will start. Each player has 13 tiles and you will have to form melds with those tiles, whether suited melds or identical melds. Each time it is a player's turn he will discard one tile. After that, the following player will have to choose one tiles from the center of the table and discard his own. As the game advances you will manage to form pong (three identical tiles), chow (meld of three consecutive suited tiles) and kong (four identical tiles), having to finish off with an eye, a pair of identical tiles that are the final component of any standard hand. Once we manage to join our 13 tiles in groups we will have formed a Mahjong and won the game. Mahjong Hero includes the instructions necessary to learn to play step by step, as well as all of the game's rules. Try out Mahjong Hero and have a good time with this classic Chinese game. The trial version can be played three times.